Threadies are often seen breaking the surface as they feed on prawns in the shallows near the water’s edge in the lower river reaches and estuaries. They are great fighting fish with hard runs and high, lure-shaking jumps. Capable of amazing speed and agility, threadfin will often jump once hooked. They can grow larger than 15kg but usually weigh 1-4 kg. A related species, the blue salmon, is caught in similar habitats to the threadfin. Other Names: Polynemidae sheridani, King salmon, gold threadfin, threadie. Location: The lower river reaches and estuaries. Season: Threadies can be found throughout the year but are more prolific in the cooler dry season months. Often prevalent when large congregations of jelly prawns are present. Method: Baitcaster or threadline outfits in the 4kg to 8kg range. They take live and dead baits but provide the best sport on lures with shallow-running, minnow-style lures taking most fish. Regulations: For up-to-date regulations, check out the Northern Territory Department of Primary Industry and Fisheries . 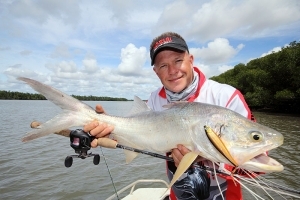 Eating: Threadfin salmon (and blue salmon) are a first-class table fish and, eaten fresh, are regarded as equal to barramundi by many anglers. They have white, firm, slightly oily flesh with very large flakes.